love this bed so disappointed that I had to wait about 2 months to get the bed. so many issues with the shipping company. The Eden platform bed features a sumptuous deep tufting with a rich velvet navy upholstery. The bed draws inspiration from a vintage-classic design. The retro styled wood finish legs flaunt an interesting twist on this otherwise classic piece. Enhance your transitional or contemporary styled home with this elegant platform bed. Available in Queen, Full or King sizes. Includes hardware with some assembly required. We are very pleased with this bed! 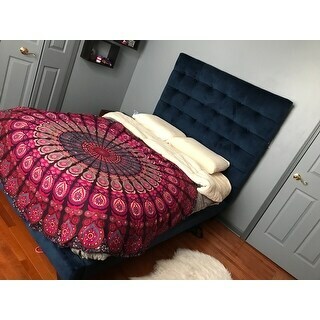 It is a very good quality bed with a rich, beautiful navy velvet. Assembly not too difficult (my husband did it alone). Highly recommend! Color and quality is great. I have no issues with the furniture, but I had an issue with the delivery/shipping crew. The worker seemed angry at me when I wasn't home at 11:15 am for the 12-4 delivery spot. Please call people in advance (at least 30 minutes) and delivery within the specified timeframe or be prepared to wait. Most people work during the day. The worker also broke the palette on the driveway when I got home... not super professional. This bed makes me smile every time I walk in the bedroom. Just love it. It took 3 adults to assemble. It does come with one tool, but it's easier if you have your own screwdriver and wrench to work with. Great purchase. They color is rich and the quality is great. Overstock always deliver on the products it sells. Thanks to other reviews, I made the right purchase. Packing was primed to keep the components in pristine condition. Easy to assemble. Great looking and sturdy bed. This bed is absolutely stunning and so much more beautiful in person. Wow. Best purchase ever. I bought this for my teenage niece. It's very sophisticated and hip and she loves it. "How close does the color match compared to the pictures online? " Perfect!!! It's a rich and beautiful color. Exactly as product display image. I wish overstock will add capabilities of customers uploading product images. "Does a standard king size mattress 76" X 80" fit this bed? Is box spring required?" The king size frame will work with a standard king size mattress. A box spring is not required as this is a platform style bed. "What are the dimensions on this bed? How high is the headboard?" "same question how high off the ground is the base of this bed? an answer would be great!" "How high off the ground is the base of bed?" I have the very same question. I store bins under my existing bed and id love to do the same here. Does anyone know how many inches from the floor to the base board of the bed? My current bed is about 6 inches. Any help would be great! thanks! I called and my very helpful customer service rep, Maddie C, called the manufacturer and they stated that the bed is 7" off the ground. "hi can you send someone to assemble by any chancw"
Unfortunately we don't offer this service. We apologize for any inconvenience we might have caused.